Vera Brittain, one of the least lost of the Lost Generation of WW I, is on her third revival as a feminist of conscience and witness, this time in a film taking the same name as the memoir through which she initially became known in 1930s England, Testament of Youth. The book became an instant best seller in England with 120,000 copies sold in the first six years. A reading tour in the United States lifted sales there as well. The Sunday Times called it “a book which stands alone among books written by women about the war”. Rebecca West wrote that it was “a vivid testimony”. Virginia Woolf noted in her diaries that she felt compelled to stay up all night to finish the memoir. When it was later published in America, the New York Times reviewer wrote that Brittain’s autobiographical account was “honest… revealing… heartbreakingly beautiful”. The 2014 film, directed by James Kent in his first full-length feature film, uses many of the elements of the book and follows the tone of Brittain’s (played by the distractingly beautiful Alicia Vikander) remembrance of her growth from an ingenuously idealistic, young, middle class woman, through her searing war experience of nursing severely wounded men, the loss of three close friends and her only brother, becoming, after the war, a writer and militant pacifist; follows it in tone, at least. The movie ends just as she finds her anti-war voice, and never opens the lens, as the book does, on her connection of pacifism and post-suffragette feminism, of which she was a major figure. The idyll of her late secondary school years with her younger brother and several of his friends is lushly filmed in green copses and lovely swimming holes. Her rebellious nature pushing against her father’s designs to turn her into a “decorated and contented inferior,” to men is fairly set forth. Though the movie starts with a bang on Armistice Day with Brittain pushing her way through celebrating crowds, to then flash back to her pre-war years, and the grueling scenes of war, it starts almost too slowly for me, the initial sequences too bucolic, too period piece British. About the time I was resigning myself to an Edwardian “chick flick,” her friends appear to tell her (shockingly) that they have dropped out of university and enlisted, very early, in the British army. The film begins to come to life, and stays there. She also drops out of Oxford, (after being improbably accepted,) caught up, as they had been, in the “need to do something,” and enters into service with the Voluntary Aid Detachment (VAD) as a nurse. She first works in aid stations in London, the wounded arriving from just across the Channel. 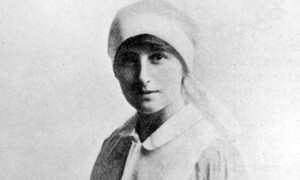 Though not demarcated in the film, she was next dispatched to Malta, and from mid 1917 to the spring of 1918 to Étaples, France, fifty miles from the front, where she and her fellow nurses, and patients, were often bombed. Sparse use of realistic scenes in the trenches, in the rain and mud, interspersed with Brittain caring for the wounded under miserable conditions, gives us a sense of war not usually portrayed in movies; war is not simply men at the front, fearful, courageous, surviving and dead, but women as well, thrown into new and unimaginable situations, overcoming their fear of carnage and death, caring for the wounded and mourning the dead. Female nursing, especially near the fighting, was still a novelty, being as new as the Crimean War and Florence Nightingale, sixty years earlier. In fact the movies misses a bit by not showing the initial command resistance to allowing women near maimed, filthy and naked men. It does nicely set up her post-war conversion to pacifism, with a moving scene of caring for German wounded, her facility in German letting her respond in a familiar way to a soldier’s death delirium. More might have been shown of her struggle to move on, to fully embrace the feminism she had instinctively recognized in herself, and her continued courageous speaking out against war as Germany began to rise from the ashes and threaten Europe again. As a movie re-regarding the war, and the effect it has not just on men, but women, Testament To Youth is a welcome addition to the genre. From my point of view, having seen dozens of films about WW I, it is a “must see,” not just for the story and fine cinematography but for the rare attempt to show the effect of war, everywhere and on everyone. If her first rise to popular acclaim followed the publication of the book in 1933 and her public opposition to the coming war, and her third with the film reviewed here, her second in British, if not fully American, life came with a 1979 BBC series, described as “hugely popular,” also based on Testament to Youth. At the same time, a new feminist press, Virago, re-issued the book. The TV series is available on YouTube and, given its longer format, is able to do what the film did not, show her growth as a public figure and advocate for women and against the war. For her biography at the Peace Pledge Union (PPU) see here. Kenneth Turan of the LA Times, loved it. The critics at Rotten Tomatoes like it better (82%) than the audience (79%) but from all, pretty high regard.